Frank Lloyd Wright’s Usonian Jewel in The Acres Restored. Photo by Tim Hills, Trystcraft. Fall 2015. West Michigan Modern organized a tour of the Samuel and Dorothy Eppstein House in The Acres at Galesburg, Michigan, east of Kalamazoo. The house was one of several Frank Lloyd Wright designs commissioned by a group of research scientists employed by Upjohn. At the time of the tour, the Eppstein house had been vacant for over 15 years. The house was empty and the original plans were laid out on the dining table. 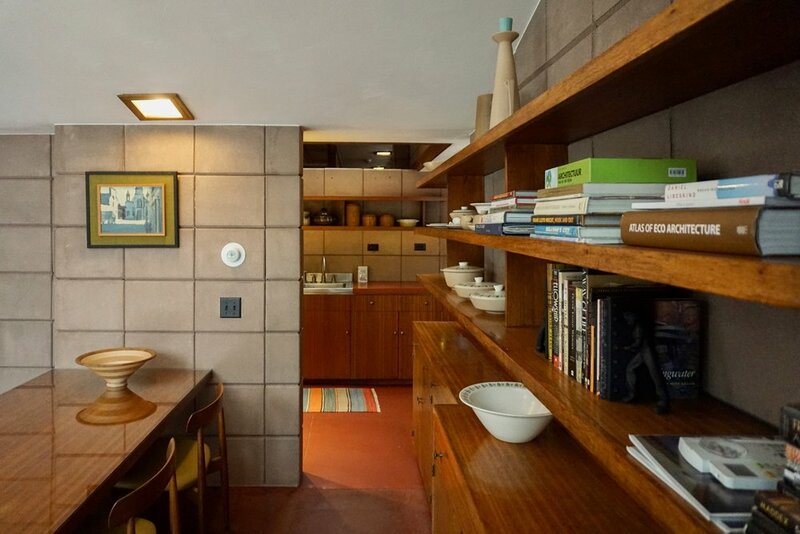 The potential was obvious, and it was the least expensive Frank Lloyd Wright home on the market at the time, with a list price of $455,000. November 2018. Marika Broere and Tony Hillebrandt bought the Eppstein House in 2016 for $368,000 and undertook a complete restoration. Now it is considered one of the premium properties on Airbnb. Link here for photos: https://www.airbnb.com/rooms/16024637. Marika and Tony invited us to see the transformation a week before Thanksgiving. The Eppstein House is a long and low structure on an unusual circular site. Frank Lloyd Wright designed the Usonian-style home to be constructed of his signature textile blocks, both solid and perforated. The perforated blocks create patterns of light and shadow on the polished concrete floors. When construction started in 1951, many of the 3,000 blocks were hand-made by the Eppsteins themselves, using the water of Kalamazoo’s Asylum Lake. Dorothy Eppstein recalled “scrubbing the blocks with a sponge and concentrated sulfuric acid to remove lime deposits left by the Asylum Lake water. Another of her jobs included drilling holes into concrete blocks to create a rough rectangle, which would then be knocked out and used for light switches and outlets. This latter job she did while pregnant!” (Michigan Modern http://www.michiganmodern.org/buildings/samuel-and-dorothy-eppstein-house) In the restoration, Tony and Marika had the textile blocks stained with a new UV protective stain specially designed for the house by the Sherman Williams Company. The original carport leads to the understated front door that in turn leads, Wright compression-release style, to a large open concept living-dining room. A strong element in this space is the dramatic fireplace made of textile blocks. The built-in platform sofa and geometric wooden stools are reupholstered in new Knoll and Maharam fabrics and the room is filled with other Wright-designed built-in shelves and free-standing tables. On that damp day, we appreciated the toasty warmth of the radiant floor heating, a standard feature in Wright’s Usonian homes. Most dramatic of all are the views of the Acres natural beauty that command your attention in this main room. The floor-to-ceiling window wall has new energy-efficient replacement glass and one of the panels leads outdoors to the unusual semi-circular patio with the brick retaining wall. The cantilevered roof tilts steeply upward. Marika and Tony made many integral repairs during the renovation. A new structural beam was required, a new ceiling was installed, and concrete floor repairs were completed. Climate control, new electric wiring, updated plumbing, a new septic system and French drains were also added. A master carpenter continues to restore the cabinets, shelves, and ledges in the bedrooms and throughout the house, when necessary, using recycled wood to maintain the original look. The wall between two bedrooms was removed by previous owners to create a larger room. An old 1950’s shower stall was replaced by a larger, esthetically pleasing style finished in vintage green tiles, found in the manufacturer’s boxes untouched since the 1950’s. At the north end of the house, under another cantilevered roof, a second living room has become a stylish oasis elevated a few steps up from the hall, following the topography of the land. The room has baseboard heating, a fireplace with new wood stove, built-in shelves, mahogany paneling and a floor to ceiling window wall overlooking another patio. The furnishings are tubular chrome chairs, in European modernist style, and a sofa upholstered in a warm gold fabric. The kitchen with its high ceiling and skylight was remodeled by a previous owner. Here, instead of adding a new stove, as so many would do, Marika and Tony found a unique and wonderful 1948 vintage range, and they installed two smaller under-the-counter refrigerators to keep the focus on the more aesthetic features of the room. 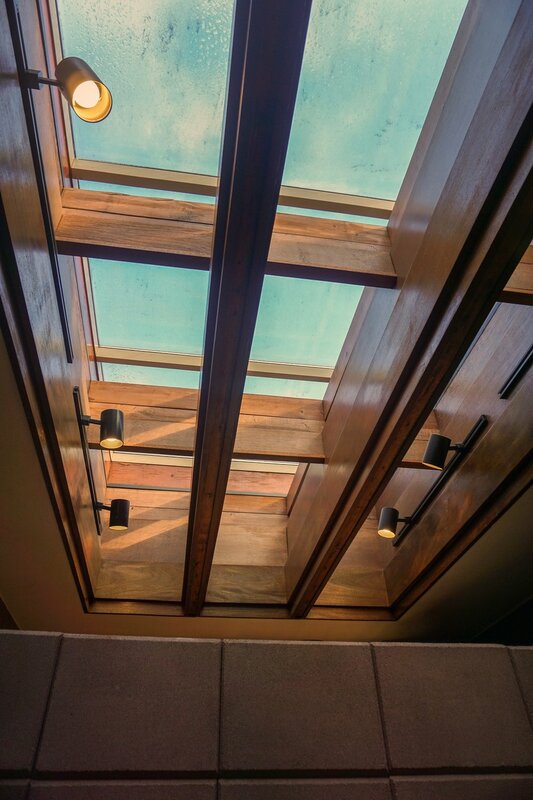 Homes are about the people that inhabit them, and Tony and Marika, who are Dutch by birth and Canadian by residence, reached out to the greater Frank Lloyd Wright community and invited as their first guests the children and grandchildren of Samuel and Dorothy Eppstein. The Eppstein children recalled that building the $45,000 Frank Lloyd Wright Usonian house (a very large sum for that time) was a financial challenge for Samuel and Dorothy, both Upjohn scientists. There was little left for additional furnishings and decor. In transforming the Eppstein House into a comfortable yet elegant home, Tony and Marika have carefully added art, architecture books and mid-century furnishings and ceramics to gracefully enhance the original Wright fixtures. They even coincidentally purchased a set of rare Danish dining chairs recognized by the Eppstein children as ones that had been owned by their mother before she died. Our visit to the Eppstein house finished with lively conversation about other modern homes and designers as we tasted Dutch “Stroop waffles,” a sweet treat often served with coffee in the Netherlands. Clearly there are two unbeatable perks of researching interesting homes. One is seeing the extraordinary homes themselves, and the other is the added bonus of meeting the visionary people who commit their time and resources to renewing these historic treasures. A group of Upjohn scientists in the mid-1940’s engaged Frank Lloyd Wright to design homes for them. The group split over the location with one faction building Wright-designed homes in the Acres and the other building their homes by Asylum Lake in Kalamazoo’s Parkwyn Village closer to their work. The Acres group built their homes in Galesburg and included in that group were Upjohn research scientists Samuel Eppstein and his wife Dorothy who served as a Woman Air Force Pilot in World War II. They started planning their home only six months after they were married. The Acres is a 70-acre site where the homes were each to be situated on one circular ace of land. The Eppstein house was completed in 1953 and is 2,250 square feet in size. The Eppsteins built much of the home themselves. See above for more details on the home’s design. In the end only four Wright-designed homes were built in the Acres and a fifth one built was designed by Francis “Will” Wilsey. 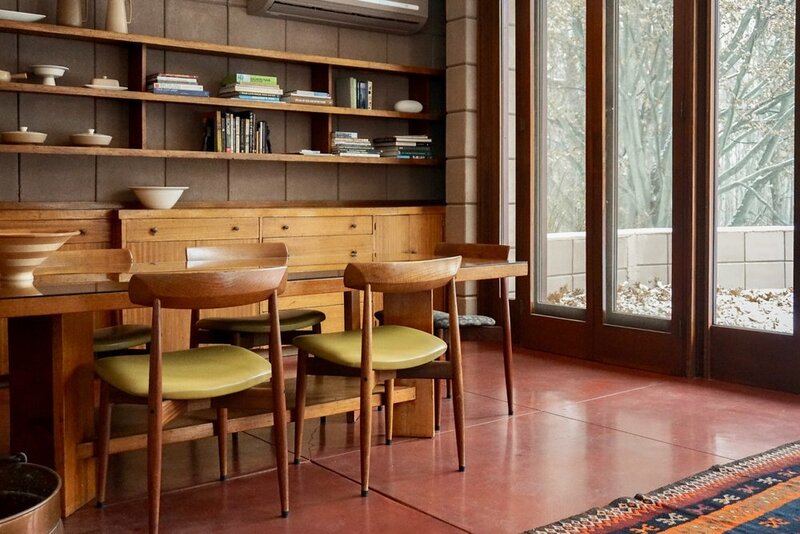 THE EPPSTEIN HOUSE: Frank lloyd wright’s jewel in the acres restored.